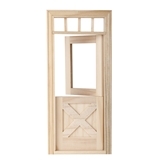 Interior five panel door with horizontal panels. Includes interior trim. 3 7/16"W x 7 /16"H Fits opening 3"W x 7"H x 3/8"D.